The Portuguese man-o-war is a species of siphonophores known by the scientific name physalia physalis. It is also known as bluebottle or bluebubble, and is actually a colony of four kinds of polyps. The Portuguese man-o-war has bilateral symmetry, with tentacles at one end and the float at the top. It also has an air bladder called a pneumatophore, or sail, that causes it to float. Without any way to move itself, the Portuguese man-o-war is pushed around the surface of the ocean by the winds and current. The man o' war's sail is filled up with air, but can build up large amounts of carbon dioxide inside its sail. It must stay wet to survive, so it will often roll around to keep the surface wet. Below this float are long tentacles that can sometimes stretch over ten meters long. These tentacles can sting and kill small sea creatures using their poison-filled nematocysts and muscles to bring the prey up into the gastrozooids, which is another type of polyp that surrounds and digests the prey. The gonozooids are the polyps that reproduce. 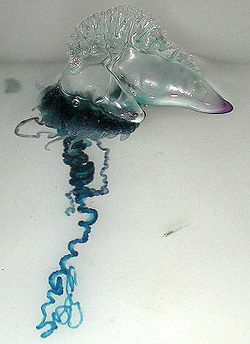 The Portuguese man-o-war often has man-of-war fish (Nomeus gronovii) living within its tentacles for protection. The nudibranch glaucus atlanticus (blue sea slug) uses a gas filled sac to float, much like the man o' war, and being immune to the poison, feeds on the man-o-war as well as other neustons (minute organisms). The Portuguese man-o-war is an important source of food to the sea turtles that are immune to the poison. Some places you might find Portuguese Man O' War are on the coasts of North America, Africa, Europe, and Australia along with a few other places in the world. The Portuguese man-o-war was recently found as far north as Cape Cod, in Massachusetts. This page was last modified on 7 March 2014, at 15:03.